The No. 62 Risi Competizione Ferrari 488 GTE co-drivers Giancarlo Fisichella, Toni Vilander and James Calado broke through for their first IMSA WeatherTech SportsCar Championship GT Le Mans (GTLM) class victory of the season in Saturday’s Petit Le Mans presented by Harrah’s Cherokee Casino Resort, the final race of the season. Meanwhile, the No. 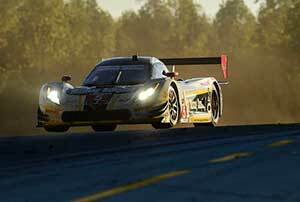 4 Corvette Racing Chevrolet Corvette C7.R duo of Tommy Milner and Oliver Gavin picked up their first WeatherTech Championship GTLM title with a third-place class result alongside endurance co-driver Marcel Fassler. 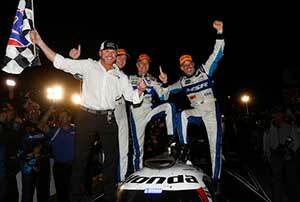 Winning three of the four longest races in the IMSA WeatherTech SportsCar Championship carried Honda to the coveted manufacturer’s championship in the 2016 Tequila Patrón North American Endurance Cup. Ed Brown, Scott Sharp, Johannes van Overbeek and Pipo Derani opened the year with back-to-back victories in the Rolex 24 At Daytona and Mobil 1 Twelve Hours of Sebring Fueled by Fresh From Florida in the No. 2 Tequila Patrón ESM Honda Ligier JS P2, and then finished second in Saturday’s season-ending Petit Le Mans Presented by Harrah’s Cherokee Resort Casino behind the No. 60 Michael Shank Racing Curb Records/AERO Honda Ligier JS P2 of Ozz Negri, John Pew and Olivier Pla. 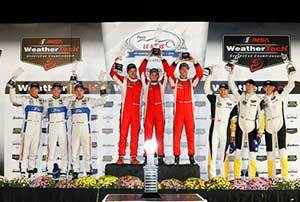 Olivier Pla held off Pipo Derani in a battle of Honda-powered Ligiers to win Saturday’s Petit Le Mans presented by Harrah’s Cherokee Casino Resort, while Corvette Daytona Prototype drivers Dane Cameron and Eric Curran captured the 2016 IMSA WeatherTech SportsCar Championship with a fourth-place finish. Pla was joined by Ozz Negri and John Pew in the No. 60 Michael Shank Racing Curb Records/AERO Honda Ligier JS P2, leading 230 of the 412 laps in their second victory of the season. After 10 hours of competition, Pla beat Derani to the checkered flag by 3.524 seconds, stopping a late-race charge by the Daytona and Sebring-winning No. 2 Tequila Patrón ESM Honda Ligier JS P2 co-driven by Scott Sharp and Johannes van Overbeek.